← Stink bugs: Telling the good ones from the bad ones. Picture credit: Mathilde Montgomery, via the AAE inbox. We get a lot of neat pictures in our inbox, and I think this is one of the cooler images we’ve gotten because there’s a lot going on in this picture. I’m not 100% certain of what the wasps are stuck in, although I do have a pretty good idea. In fact, I’m more confident about the ID of the wasps than I am the substance they’re stuck in. So…what’s going on in the picture? Those wasps are a representative of one of my favorite families, the Evaniid wasps. They’re also known as cockroach, or ensign wasps. They’re easy to identify because their tiny abdomens are attached really high on their thorax, so they always hold their butts really high like a flag. That’s how they get the name Ensign wasps. They’re also nice things to have around, since they lay their eggs in cockroach egg cases. The larvae develop inside the egg case, and eat the eggs contained inside. Most species attack wild non-pest roaches, but Evania appendigaster will attack some of the more common pest species. It’s been investigated as a biological control, and can be common in areas with lots of cockroaches. I can’t tell what species they are, but I’d imagine they’re one of the native species which attacks non-pest roaches. They’re pretty cool bugs. My best guess for the goo is that it’s the sap of a pine tree, which can be released in large quantities during routine landscaping. It can also be released if the tree is attacked by beetles, horntails, or woodpeckers trying to eat the larvae of beetles and horntails. All plants make chemicals they use for defense, and many of these chemicals are quite valuable. A lot of the stuff we taste in food, for example, is either insecticidal or antimicrobial. Cinnemaldehyde, the main flavoring component of cinnamon, is an antifungal agent. Anethole, which gives anise it’s flavor, works the same way lindane…a pesticide now banned from production. Most plant defensive compounds are alkaloids, but the defensive compounds of pine trees are called terpenoids. Since plants can’t poop, a lot of these compounds contain nitrogen. Alkaloids contain nitrogen, while terpenoids don’t. Pine resin contains a lot of terpenoids, many of which mimic hormones which are unique to insects. They’re thought to interfere with the juvenile hormone pathway and keep insects from maturing into adults. There’s a really famous compound called juvabione which is discussed in entomology classes, mainly to let budding entomologists know that their choice of paper towel can actually determine whether their insects will live or die. Entomologists deal with some really weird problems at work. There’s another way that pine resin kills insects, though. Pine resin is a really thick and chemically complex liquid which comes out at high pressure, and hardens after some of the more volatile parts of the mixture evaporate. So it physically pushes the insect out, while trapping it in a hardened case. It keeps hardening after it comes out, so the insects will never dig their way out. Eventually, the mixture drops to the ground and just kind of stays there because of a mix of antimicrobial properties and a lack of water. Let it sit a few million years, and you’ve got amber. 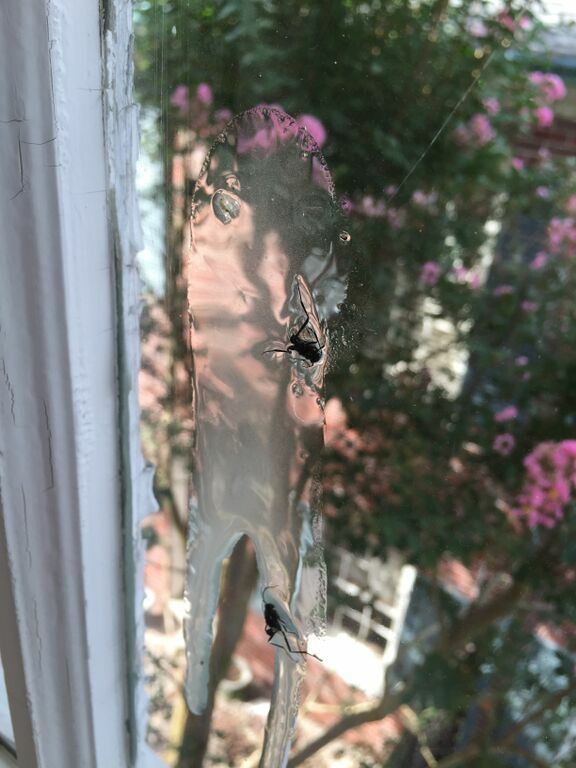 My best guess for the story behind this picture is that these wasps were hunting for cockroach egg cases, and got caught in a sticky situation because they were in the wrong place at the wrong time. I think this picture is also really cool, because it reminds us that the artifacts which allow us to study the past are still forming as we speak. 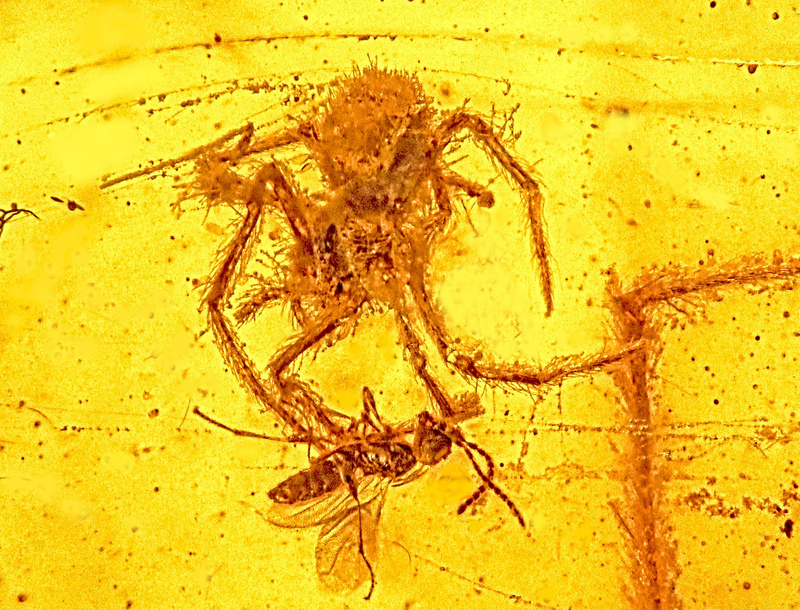 Amber is really valuable to entomologists because it’s the main fossil record for insects. We can look at Earth’s history through a series of happy accidents, and learn a lot about what happened a long time ago through stuff like this. This entry was posted in Chemistry, Ecology, Education, Taxonomy and tagged Beneficial Insects, Biochemistry, Cockroach, Hymenoptera, Physiology. Bookmark the permalink.